Antoine shares his side of the story. Men’s Open Bodybuilding competitor Antoine Vaillant responded to Jeremy Buendia’s rant about the lack of respect for the Men’s Physique division after Vaillant guest posed in board shorts. But Men’s Physique competitors wear board shorts on stage, so Jeremy Buendia took it as Vaillant mocking his division. 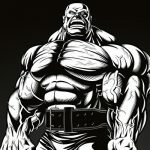 Buendia then posted a lengthy rant about the lack of respect from Open bodybuilders and pretty much everyone else too. So, Vaillant responded on Nick’s Strength and Power’s video implying that he was not mocking Men’s Physique but rather posing in board shorts to kind of appreciate all the other divisions in men’s bodybuilding and try on a different look. Jeremy Buendia is a four-time Men’s Physique champion and made it clear that he’s doesn’t want to compete anymore since he’s worked so hard only to be treated so disrespectfully. Antoine Vaillant recently made a post where he explained how he’s been getting a lot of feedback on his guest posing in board shorts and how many people have been sending pictures of themselves in board shorts. So, he decided to create a board shorts challenge just for fun! Vaillant wanted to make it very clear that he was not trying to mock the Men’s Physique division. “I’m going to say it once, this is not to make fun of the Men’s Physique division”. Do you think Jeremy Buendia was out of line or justified in his actions? Shawn Rhoden Responds to Vacuum Pose Fan Request: "Let's Do This"